VPN use is a must in Vietnam and in this guide we’re going to show you the Best VPN to keep you safe, protect your privacy and allow you to access blocked and restricted websites. There’s a lot of misinformation when it comes to searching for VPN services and most of the information is based on which is most suitable for western countries such as the USA or UK. If you do find reliable information on Asia it will usually concentrate on China, Thailand or Indonesia. We’ve tested a whole host of providers in Vietnam and below we’ve rounded up the 5 that we found to be most suitable to use in the region. Whether you live or are travelling in the country or throughout South East Asia as a whole, these 5 VPN providers will have you covered. All that’s left for you to do is select one and sign-up. You really can’t go wrong! Local coverage is essential if you’re in Vietnam and IPVanish tick that box easily. Servers are available in Hanoi, Vietnam that will give you the best speeds and allow you to stay protected when connecting to public Wi-Fi hotspots. If you want to tunnel out of Vietnamese internet restrictions then you’ll need to select a server in another country. Thankfully IPVanish has a huge array of choice in Hong Kong that allows for browsing privately. It’ll also allow you to access websites that are blocked in Vietnam. Further afield more server choice is available in Singapore, Malaysia and the Philippines. If you want to access TV content from countries such as the UK, USA, Canada and Australia then all major countries are covered and you’ll be able to unblock your favourite TV services. Apps are available for both Android and iOS devices and there is also software for Windows PC’s and Mac. There is even an Amazon app so if you have a Fire TV or Fire TV Stick in Vietnam you can protect your privacy and access overseas content on it. If server locations are what you’re after then ExpressVPN certainly makes the best choice for use in Vietnam. There are VPN servers and Virtual Servers in over 94 countries around the world. Vietnam certainly isn’t left out in all that either as there are local servers in Vietnam and also in many nearby countries. A selection of which include Thailand, Cambodia, Laos, Hong Kong and many more. With censorship on the rise in Vietnam and some neighbouring countries, it’s definitely an advantage to have such a large choice of servers available to connect to. Apps and software are available for all major systems and there is even software for Ubuntu Linux devices so if you’re a Linux fan then you’re covered. Our favourite feature is the massive 30-day money back guarantee which is available on the service. This gives you basically a full money to test the service and if you’re unhappy then simply get a full refund. NordVPN has grown considerably in the past few years and the fact they offer some unique features has aided this. Our favourite feature of their service is the double VPN servers that pass your data through two different locations. If you’re worried about Vietnamese internet monitoring or you’re posting sensitive details online then this added layer of privacy will benefit you. A nearby double VPN server is available from Taiwan to Hong Kong which will be suitable for use in Vietnam although you will experience a little speed loss. Alongside the double VPN servers, NordVPN also offers local servers in Vietnam, Thailand, Hong Kong, Taiwan, Singapore, Malaysia and a whole host of other countries across Asia. 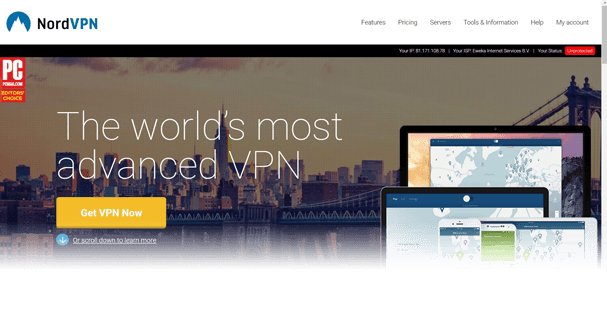 NordVPN scored one of our highest ever review scores and our reviewer found them to offer an exceedingly good VPN service. VPN.ac won’t be suitable for everyone because they don’t offer a server in Vietnam. However, even though they’re lacking a local server they do have servers in Hong Kong, Singapore, South Korea and Japan. We’ve included them mainly on the basis of speed. They’re one of the fastest VPN providers we’ve used and if you’ve tried other providers before and found them to be too slow then you’ll really appreciate using VPN.ac. Unlike most providers, they don’t oversell their service which means their servers are relatively low utilised allowing you to get the best speeds out of the service. VPN.ac also offer some advanced encryption modes on the OpenVPN protocol which will let you remain private from government snooping and other Vietnamese internet censorship. The service can be a little expensive paying monthly but is extremely cheap when signing up annually. Payment is also accepted via all the usual methods but also Bitcoin and a range of other Altcoins such as Ripple, Ether and more. PrivateInternetAccess is one of the world’s biggest VPN providers with over 1-million registered users and it isn’t without good reason. There are countless positive reviews from users all over the internet and in our own tests, we found them to offer a pretty decent service too. Paying monthly is cheap enough but when you opt for a year it makes them one of the cheapest services on the market. At just US$3.33 p/m which equals around £2.53 or 75,650 VND at current rates. If you’re on a Vietnamese salary or you’re after keeping costs low then you’ll definitely appreciate the price. Although they don’t have a local server in Vietnam they do offer servers in Hong Kong, Singapore and South Korea as well as total of 25 countries. It’s possible to connect on up to 5 devices at the same time so if you have multiple computers, tablets or phones or you want to protect your entire family then you can do that with just one account. Whether you’re an expat living in Vietnam, travelling there for a period of time or you’re a permanent resident, a VPN is an essential tool to keep yourself safe. Using public Wi-Fi in Vietnam can be risky just like in any other country, a VPN will protect your connection to ensure your data remains safe. Vietnam blocks a handful of both Vietnam language and English websites, using a VPN will allow you to bypass these restrictions. Content such as blogging is also monitored so if you want to post as anonymously as possible to reduce the chances of repercussions then a VPN is definitely recommended. We recommend IPVanish for use in Vietnam but any of the 5 above are suitable. All you need to do is choose one and sign up, you can’t go wrong.